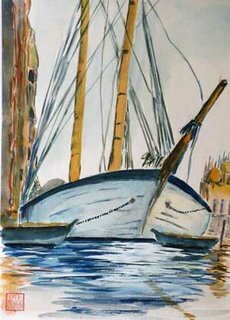 This is a painting of a yacht resting in the harbour. It is done is very loose style after I was inspired by one of John Singer Sargeant's works. I was experimenting with something totally new and attention was paid to strokes of vibrant colours, especially lemon yellow and vermillion. I think one of the best ways a painter, a watercolour painter, can do for himself is to forget to be too mechanical in his/her painting. Don't allow pure logic to rule the brush and just paint what is before them. This will result in a loose and relaxed style. Just came across your blog! It's wonderful to see a fellow amateur watercolourist blogging and I want to give you my encouragement! Please keep it up.